Rising food costs, poor ‘Gu’ seasonal rains earlier in the year and continuing insecurity in parts of southern Somalia are affecting the nutritional status of vulnerable people there - a situation that could worsen in the coming months amid the risk of flooding, warn experts. In Mogadishu, the cost of a 50kg bag of wheat flour has gone up from US$22 to $36 in a month. “There is not enough supply of wheat flour in the markets because businesses are importing less flour due to storage [problems],” Fatima Hassan, a businesswoman, told IRIN. Wheat flour is the main ingredient used in making anjera, a typical Somali breakfast food. The price of cooking oil has also gone up, with a 20-litre jerrycan selling at $28.50, up from $27 last month, though the price of sugar and rice remains largely unchanged, with 50kg costing $37.50 and $52, respectively. “A year ago, $130 was enough for my family of eight, but now I have to pay more than $200 [per month on food],” said Mowlid Sheikhdon, a pharmacist in Mogadishu. “Our family has been forced to consume less meat,” Sharif Hussein, a father of five, told IRIN in Mogadishu. An Oxfam survey carried out between July and August in 40 districts in the south-central region and in the north-eastern self-declared autonomous region of Puntland found that the average family is spending $28 a week on food and fuel. “For a typical family of eight, this is equivalent to just 50 cents per person per day. At current market prices, this would not pay for the minimum food intake - so even when families are buying food, they are still likely to be chronically food insecure,” said Oxfam in a briefing. Still, the prices, while high, are lower than they were this time last year. A rise in insecurity and high import costs could see prices escalate even more as incomes fall. Oxfam found that incomes were two-thirds lower than during a normal April-to-June ‘Gu’ season because of decreases in livestock, crop and milk production. The `Gu’ season accounts for 60-70 percent of Somalia’s cereal harvests, but there have been low harvests in the major sorghum-producing region of Bay, which normally accounts for almost two-thirds of the country’s crop. The Middle Juba, Lower Shabelle and Gedo regions have also recorded significantly smaller maize harvests. This year’s poor Gu rains followed the 2011 humanitarian crisis, when the country saw devastating livestock and livelihood losses, and two regions experienced famine. Many regions are facing severe water and food shortages, with children and pregnant women the most vulnerable, according to Oxfam. “Of the families surveyed, almost 50 percent had experienced a recent death in the family, and of those deaths almost 60 percent were pregnancy-related or of pregnant women,” Alun McDonald, Oxfam’s media and communications officer for the Horn, East and Central Africa region, told IRIN in an e-mail, adding that more analysis is needed to determine why this number is so high. Health facilities are insufficient in southern regions such as Bakool, Gedo, Mudug, Middle Shabelle and Lower Juba. A child east ready-to-use-food (RUF) at a feeding centre in Somalia. According to a 26 September Food Security and Nutrition Analysis Unit - Somalia (FSNAU) report, an estimated 236,000 Somali children are acutely malnourished and in need of specialized nutrition treatment. Among them, 54,000 are severely malnourished, requiring immediate life-saving interventions. Seventy percent are from the southern regions, where vital basic services are not easily accessible. At Oxfam’s feeding centres in Mogadishu - which is not the worst affected area - some 3,000 children with severe acute malnutrition (SAM) and 5,000 with global acute malnutrition (GAM) are treated per month, said McDonald. 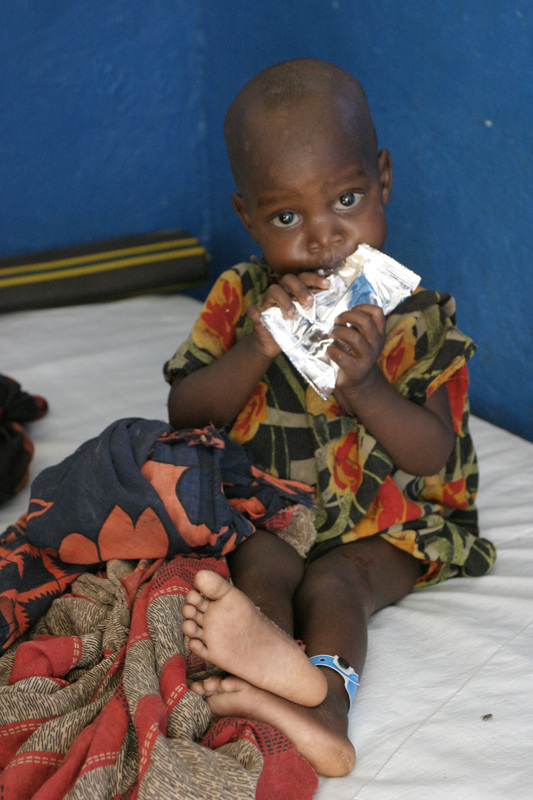 GAM refers to the total rate of acute malnutrition in a given population, while SAM is a sub-category of GAM. SAM is life threatening. The level of need in south-central Somalia could increase with the October-December rains, which are expected to result in flooding and may be enhanced by the El Niño weather phenomenon. The southern region of Hiraan has already been hit by flooding; around 60,000 residents affected by floods and conflict are receiving emergency food rations, according to the International Federation of the Red Cross and Red Crescent. Moderate-to-heavy rains have also been reported in many parts in southern Somalia. According to Oxfam, southern Somalia is still in crisis, with the emergency being most acute in the South East Gedo region, the riverine zone of Lower Juba and Bakool. An estimated 2.12 million people in Somalia will remain food insecure until December.